Meeting of the Disaster Management Support Group (DMSG), Committee of Earth Observation Satellites (CEOS), French Space Agency – Centre National d’Etudes Spatiales (CNES); Paris, France. Routine working visit of GTZ-Indonesia Integrated Forest Fires Management (IFFM) staff member, Mr. Hartmut Abberger; GFMC. Routine working visit of GTZ-Indonesia Integrated Forest Fires Management (IFFM) staff member, Ms. Anja Hoffmann; GFMC. GFMC authorized by the Director a.i. of the ISDR Secretariat authorizes the GFMC to use the UN ISDR logo in the GFMC-Working Group on Wildland Fire letterhead; Geneva, Switzerland. Meeting of the German National Committee for Disaster Reduction (Deutsches Komitee für Katastrophenvorsorge – DKKV); preparation of German contribution to the World Summit for Sustainable Development (WSS); Bonn, Germany. Meeting of the German Federal Office for Nature Conservation (Bundesamt für Naturschutz); discussion of a concept for a fire research program; Bonn, Germany. GFMC invited to become member of the Forest Fire Monitoring and Mapping Implementation Team, Global Observation of the Forest Cover (GOFC) program of the Global Terrestrial Observing System (GTOS); Canadian Space Agency, Ottawa, Canada. German Research Council (Deutsche Forschungsgemeinschaft  DFG) Round Table on a national Early Warning Research Programme; Bonn University, Bonn, Germany. 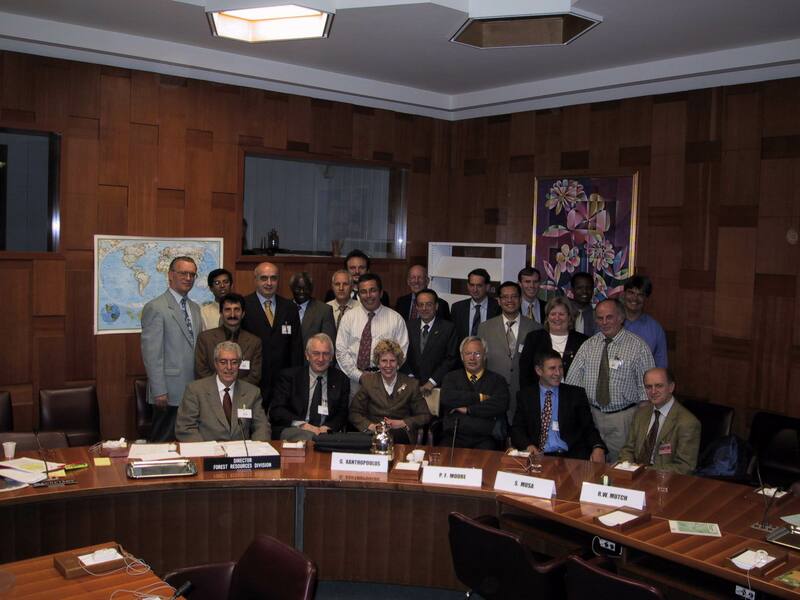 GFMC contribution to FAO Global Forest Fire Assessment 1990-2000 finalized and delivered to FAO. GFMC support to TACIS Russia Forest Fire Information System, Avialesookhrana; Pushkino, Moscow Region, Russian Federation. Meeting of the Executive Board of the German National Committee for Disaster Reduction (Deutsches Komitee für Katastrophenvorsorge – DKKV); Bonn, Germany. GFMC briefing at the UN Office for the Coordination of Humanitarian Affairs (UN OCHA), in preparation of joint UNEP-OCHA-GFMC interface procedures on information flow in international fire disaster support; Palais des Nations, Geneva, Switzerland. Meeting in ISDR Secretariat, in preparation of launching the Working Group on Wildland Fire; Palais Wilson, Geneva, Switzerland. GFMC Annual Course on Fire Ecology and Fire Management, at Freiburg University, Faculty of Forest Science; Freiburg, Germany. Preparation of ISDR-IATF Working Group on Wildland Fire and FAO Expert Consultation on International Cooperation in Forest Fire Management, with Mr. Brian J. Stocks, Forest Fire and Global Change Research, Canadian Forest Service, Natural Resources Canada; GFMC. FAO Expert Consultation on International Cooperation in Forest Fire Management; FAO Headquarters, Rome, Italy. GFMC teaching contribution to the COACh International School on Atmospheric Chemistry, “Chemical, Physical and Biogenic Processes in the Atmosphere”, Conducted by the Max Planck Institute for Chemistry, 5-16 March 2001; Obernai, France. GFMC presentation on international cooperation in fire management at the International Conference “Forest Fires 2001”, 13-16 March 2001; Athens, Greece. Exchange visit of U.S. Bureau of Land Management (BLM), Fire and Aviation, National Interagency Fire Center (NIFC) staff member Ms. Jodi Camrud, in continuation of the International Fire Management Demonstration Project at GFMC (April 2000); GFMC and Brandenburg State, Germany. GFMC and UN Office for the Coordination of Humanitarian Affairs (UN OCHA), UNEP-OCHA Joint Environment Unit, Emergency Services Branch sign interface procedures on information flow in international fire disaster support; GFMC and Geneva, Switzerland. Exchange working visit of GFMC at U.S. Bureau of Land Management (BLM), Fire and Aviation, National Interagency Fire Center (NIFC), Boise, Idaho, on cooperation between GFMC and BLM. GFMC participation (with Larry Hamilton, Tome Frey, Connie Lewis, Jodi Camrud and other BLM representatives); contribution to the annual meeting of the Montana Academy of Sciences and Montana State University chapter of the Society of the Sigma Xi (with Dr. Frank Albini and Dr. Don G. Despain, Northern Rocky Mountain Science Center, USGS), Bozeman, Montana, and visit of the 1998 wildfire sites at Yellowstone National Park; Idaho and Montana States, U.S.A.
GFMC presentation at the national meeting of German Academic Exchange Service scholars at Freiburg University; Freiburg, Germany. Third Meeting of the Inter-Agency Task Force for Disaster Reduction, UN International Strategy for Disaster Reduction (ISDR). GMFC reports on the state of preparation of the Working Group on Wildland Fires (Working Group 4); Palais des Nations, Geneva, Switzerland. Continuation of joint work on the FAO Guidelines for Fire Management in Temperate and Boreal Forests, with Dr. C. de Ronde (South Africa); GFMC. Report on the UN Secretary General “Implementation of the International Strategy for Disaster Reduction”. UN General Assembly, Economic and Social Council (ECOSOC), A/56/68-E/2001/63; GFMC listed as leader of the Working Group on Wildland Fire, in the frame of the Inter-Agency Task Force on Disaster Reduction; New York, U.S.A.
GFMC consultation on cooperation with the First Vice Minister, Ministry for Emergency Situations of the Republic of Belarus, Mr. Enver Bariev, and GFMC presentation at the “International Conference on Emergency Situations: Prevention and Liquidation” (Minsk, Belarus, 22-24 May 2001); consultations on cooperation with the Laboratory of Science and Research Institute of Applicable Physical Problems, Belarus State University, Dr. Valery Shamal; Ministry of Forestry, Mr. Ivan Georgievich Mysleiko, and the Director of Bellesavia Aerial Fire Service, Mr. Aleksey Michailovich Pshonko, Minsk. Participation in the Forestry Conference with bilateral talks with the Russian Vice Minister for Natural Resources and Chief of the Federal Forest Service, Mr. Kukuyev, the Head of the Russian Aerial Fire Service Avialesookhrana, Mr. N. Kovalev, and the Avialesookhrana Science and Technology Officer, Dr. E.P.Davidenko; Domcheritze, Belarus. Visit of the forest fire-affected and fire-endangered sites region of the closed zone around the Chernobyl Nuclear Power Plant; Belarus. German Foreign Office provides funding to GFMC to build the Krasnoyarsk Fire Webserver, Fire Laboratory, Sukachev Institute of Forest, Russian Academy of Sciences, Siberian Branch; Krasnoyarsk, Russian Federation. Consultations with representative of the consortium Aerospace Project Development Group (Zurich, Switzerland) and BETAIR, the Russian marketing company of the Be-200 amphibious fire fighting aircraft, Dr. H. Hagena, on the establishment of an international Be-200 airtanker fleet for large fire intervention; Bonn, Germany. Joint meeting of the Scientific and Operative Advisory Boards of the German National Committee for Disaster Reduction (Deutsches Komitee für Katastrophenvorsorge – DKKV); Bonn, Germany. Initial consultations with new GFMC staff and associated research scientist candidates, Mr. Alex Held and Mr. Marco Hille; GFMC and St. Valentin, Günterstal, Germany. Meeting of the Disaster Management Support Group (DMSG), Committee of Earth Observation Satellites (CEOS), European Commission Offices; Brussels, Belgium. Field preparation of the 2001 forest fire experiment conducted by the GFMC in the frame of the German Research Network for Natural Disasters (Deutsches Forschungsnetz Naturkatastrophen – DFNK); Cottbus and Lausitzer Braunkohle AG, Cottbus, Germany. GFMC participation at the workshop of the Global Observation of Forest Cover/Global Observation of Landcover Dynamics (GOFC/GOLD) – Fire Mapping and Monitoring, a project of the Global Terrestrial Observing System (GTOS) programme, sponsored by the Integrated Global Observing Strategy (IGOS); GFMC acting as member of the GOFC-GOLD Fire Implementation Team; Lisbon, Portugal. Consultations with FAO Fire Management Consultant, Dr. Robert Mutch, on FAO fire programme and follow-up of the FAO Expert Consultation on International Cooperation in Forest Fire Management (11-12 July 2001), GFMC. Dr. Bryan Lee, Natural Resources Canada, Canadian Forestry Service, to inaugurate the Experimental Eurasian Fire Weather Information System, a joint activity of CSF Canada and the GFMC; GFMC. United States Bureau of Land Management (BLM), Office of Fire and Aviation, confirms partnership with the GFMC and the UN-FAO/ECE/ILO Team of Specialists on Forest Fire; Boise, Idaho, U.S.A.
GFMC contribution to the “International Conference on Community Involvement in Fire Management” on ” Community participation in integrated forest fire management: Experiences from Africa, Asia and Europe”; Balikpapan, East Kalimantan, Indonesia. GFMC consultations at the Indonesia-German (GTZ) Integrated Forest Fire Management (IFFM) project; Samarinda, East Kalimantan, Indonesia. Wildland fire training and heli-rappelling with the Federal Russian Aerial Forest Fire Service Avialesookhrana at the Tyumen Aviabasa, Uvat and Tyumen, Tyumen Region, and in Avialesookhrana headquarters, Pushkino, Moscow Region, Russian Federation. Handover of technical equipment for the Krasnoyarsk Fire Webserver, Fire Laboratory, Sukachev Institute of Forest, Russian Academy of Sciences, Siberian Branch; Krasnoyarsk; handover of the Experimental Eurasian Fire Weather Information System to the Federal Russian Aerial Forest Fire Service Avialesookhrana; Pushkino, Moscow Region, Russian Federation. German Ministry for Education and Research (Bundesministerium fuer Bildung und Forschung  BMBF) grants a 3-year research contract on a Global Vegetation Fire Dataset, to the GFMC, a component of the German Climate Research Programme DEKLIM. Consultations with government authorities of Guatemala and non-government organizations on fire management. Facilitation of the forum “Community-Based Integrated Fire Management” for the Project “Prevención y Control Local de Incendios Forestales” (PRECLIF), Petén, Guatemala, 15-16 August 2001, supported by the German Agency for Technical Cooperation (GTZ), in cooperation of with the “Red Comunitaria de América Central para la Gestión de Riesgo”, at local level in four municipalities (San Benito, San Francisco, La Libertad and Sayaché); Guatemala. Fire management training with the Craig-Routt Fire Management Unit, Bureau of Land Management (BLM); Colorado, USA. Forest fire experiment conducted by the GFMC in the frame of the German Research Network for Natural Disasters (Deutsches Forschungsnetz Naturkatastrophen – DFNK); Cottbus and Lausitzer Braunkohle AG, Cottbus, Germany. Field preparation of prescribed burning field trials for the conservation of Atlantic heathlands in nature reserves of Sylt Island and other protected areas in Schleswig-Holstein State; Braderup, Sylt, Germany. Meeting of the Executive Board of the German National Committee for Disaster Reduction (Deutsches Komitee für Katastrophenvorsorge – DKKV) with the Director of the ISDR Secretariat, Mr. Salvano Briceno, at GeoForschungszentrum; Potsdam, Germany. GFMC awarded withGolden State Medal, Baden Württemberg State (Germany) for Merits for Rural Space, Agriculture, and Forestry, by Government of Baden Württemberg State; Stuttgart, Germany. Government consultations on the development of a “National Forest Fire Management Strategy and Action Plan” for Albania. National Round Table Meeting on Forest Fire Management in Albania; Tirana, Albania. GFMC awarded the “United Nations Sasakawa Award for Disaster Reduction”; Palais des Nations, Geneva, Switzerland. Government consultations and field exploration on Integrated Fire Management with GTZ Project Nature Conservation and Bufferzone Development, in cooperation with the FAO Technical Cooperation Project “Strengthening Forest Fire Management” (TCP/MON/0068) and the Mongolian Academy of Sciences; Ulan Baatar, Mongolia. Letter of Agreement signed between the World Health Organization (WHO) and the Max Planck Institute of Chemistry, on cooperation in the field of vegetation fire emissions, air quality and human health; Mainz-Geneva, Germany-Switzerland. GFMC convenes initial meeting of the Working Group on Wildland Fires (Working Group 4), Inter-Agency Task Force for Disaster Reduction, UN International Strategy for Disaster Reduction (ISDR); Palais des Nations, Geneva, Switzerland. Fourth Meeting of the Inter-Agency Task Force for Disaster Reduction, UN International Strategy for Disaster Reduction (ISDR). GMFC reports on the initial meeting of the Working Group on Wildland Fires (Working Group 4); Palais des Nations, Geneva, Switzerland. Host of visiting delegation of the Aerial Forest Fire Service of RussiaAvialesookhrana, represented by Mr. Nikolay A. Kovalev, Director of Avialesoookhrana, and Dr. Eduard P. Davidenko, Chief of the Science and Technology Division; GFMC. Signing of a Protocol on mutual cooperation between the GFMC andAvialesoookhrana; GFMC. GFMC convenes second meeting of the Working Group on Wildland Fires (Working Group 4), Inter-Agency Task Force for Disaster Reduction, UN International Strategy for Disaster Reduction (ISDR); Palais des Nations, Geneva, Switzerland. GFMC delivers draft translation of Mediterranean Guidelines on Forest Fire Management to FAO. GFMC starts monitoring of Australia’s Christmas Fires and offers liaison to EMERCOM of Russia for assistance.